My husband and I are trying to get our fill of summer cherries before they're all gone (that is until next summer). There's nothing quite like fresh sweet cherries and we've been eating them after dinner every night. But I thought I'd shake things up a bit and bake with some of them instead. 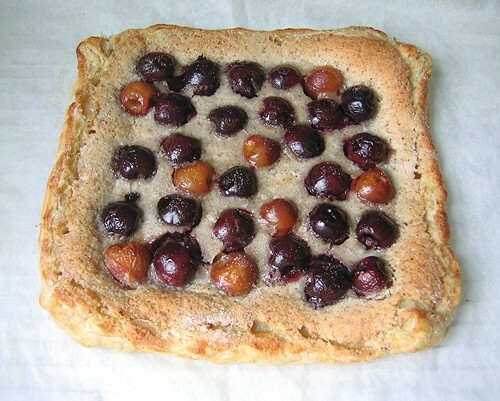 I used a combination of bing and rainier cherries in my galette. I've never baked with fresh cherries before much less needed to pit so many en masse. So I dug out my never used high volume cherry pitter that I bought on clearance many years ago. The pitter was a fun gadget and it pretty worked well too, but there was cherry juice splattered all over the front of my apron and the kitchen countertop too. I guess that can't be avoided when the cherries are so plump and juicy. If you use store bought puff pastry like I did (or have a stash of homemade like I'm sure some of you do), it comes together pretty quickly. The cherries went really well with the almond filling (which is also really easy to mix up if you use store bought almond meal). Overall, the galette was not too sweet and made for a very nice dessert with coffee. And the cherries are my "red" for the 18th installment of the "Weekend Cookbook Challenge: Red and White" being hosted by Sara at I Like to Cook. I'm so happy that I can participate in my very first WCC! Preheat oven to 425F. Combine almond meal, sugar, and salt in a large bowl. Mix in the butter then the egg until mixture is smooth. On a sheet of parchment paper, roll out each sheet of puff pastry to about 1/8-inch thick keeping a squareish shape. In a small bowl, whisk egg yolk and heavy cream and brush over the surface. Fold up the edges to create a 1-inch edge (you can just fold it or crimp it). Prick dough all over with a fork (but don't prick the edges). Transfer parchment and pastry to a large baking sheet. Freeze until firm, about 15 minutes. Spread half the almond filling in an even layer on each piece of chilled pastry. Arrange the cherries in a single layer over the almond filling. Freeze for another 15 minutes. Bake the galettes for 15 minutes at 425F. Sprinkle the 1 tbsp granulated sugar over the galettes and continue to bake until the edges are golden brown, about 5-10 minutes. Transfer the galettes (with the parchment) to cool on a rack. Serve warm or at room temperature. This makes me want to go out and get some cherries!! Looks wonderful. I love the combo of cherries (especially Rainier) and almond. I usually left the pitts in for extra flavor but kuddos to you for removing them...that's a job! Ah cherries! Yummy! I used a red cookbook, guess I cheated! This sounds like a very nice combination! I am loving the cherries this season just the way they are. This one looks grand though. I think I would be too lazy to pit them all though!! 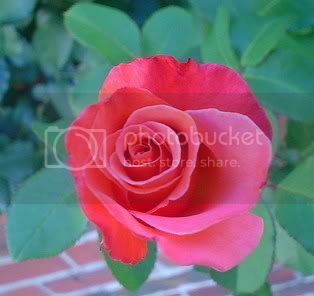 Hi Mary, thanks for visiting my blog. 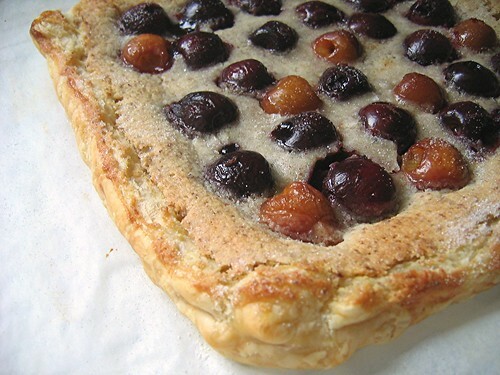 Your Cherry Frangipane Tart looks fantastic! Alpineberry has been on my list of favourite food blogs eversince I started my own blog in November of last year, but I am a 'Lurker' more often than not and wow at other blogger's blogs quietly most of the time. So, You have a thing for Colin Firth, huh? I get that a lot from the other bloggers too. I think it's Hugh Grant's bad boy image that puts people off, I guess. Thanks again, Mary, hope you will drop by again sometime! Mary I love these pictures but I'd really enjoy a small bite with my coffee about now. My son was always only too happy to pit cherries if I would make the pie! That is so lovely - makes me want to go get some cherries but they're priced so exorbitantly here since we get them imported in. 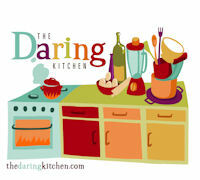 Saw u're hosting the next SHF, sounds like a great theme. Will definitely make something tropical since I'm living in the tropics! Heavenly! Your tart reminds me of summer! I'd been having a craving for cherry tart. 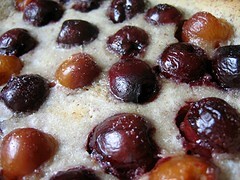 I recently polished off several cherry clafoutis tart from Balthazar here in New York. I could imagin how it taste with frangipane. Looks fantastic. I have that Martha book and I love reading through it, but I have yet to make anything from it. Hi Mary! I guess as you say, the slight cherry splatter mess is a small price to pay for such a delicious bounty! Your galette looks wonderful! That looks like a delicious edible board game with the round cherries in it. And you have a cherry pitter? Wow, that is something I don't have on my list.....yet. Lovely! We've been going through bags of cherries but I've only baked one thing with them. Too much fun to eat as is. Although your gadget does have a high toy factor my kids would enjoy! 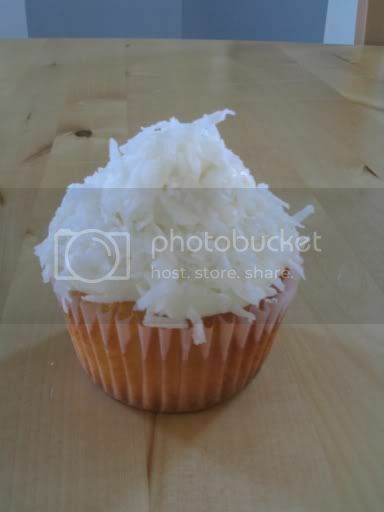 It looks rustic and truly delicious. I'll have a slice with a cup of tea please. I just bought my first batch of cherries for the year. Thanks for sharing such a delicious recipe. Lovely Mary! Thank you for taking part in WCC.